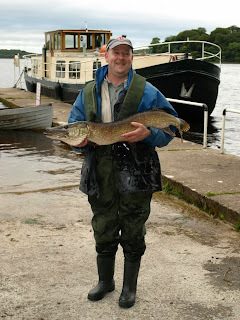 We will be holding our annual New Years Charity pike angling competition on Sunday, January 1st, 2009 on Lough Key. Fishing from 11am til 4pm. Entry fee € 20 per angler. All proceeds will go to charity. Boyle & District Angling Club would like to sincerely wish Everybody a Merry Christmas and a Happy New Year! Hope to see you all at our New Years Day Charity Competition on Lough Key. Tight Lines & Have a Great Christmas! The AGM of Boyle & District Angling Club was held last night. A new format for the club was introduced in agreement with all those present and new officers and a committee were elected to look after the management of the Club for the next year. I am personnally excited about this new concept and in particular about the fact that a few more of the younger generations have made it into the committee and will be able to have some input into the running of this club. I want to congratulate the new chairman and his committee and sincerely wish them/ us the best of luck with the tasks ahead. So it looks like you are going to put up with me here on this medium for another while as the running of the blog is now part of the PRO job-sheet. Thanks to everybody for showing an interest and looking in here over the past year. I will try to update this column frequently with hopefully some relevant and interesting items on a continuing basis. An update with photos of our Christmas Party and Presentation of the Angler of the Year will follow here soon. 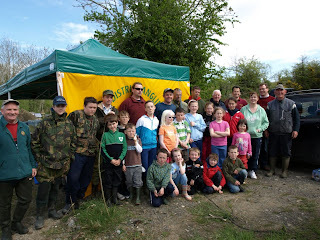 An EGM (Extraordinary General Meeting) of Boyle & District Angling Club will be held on Thursday January 8th 2009 in Tawnytaskin School, Boyle. On the agenda for this meeting is the presentation and hopefully adaption of a constitution for the Club. Our next fixture is the Clancy Cup. 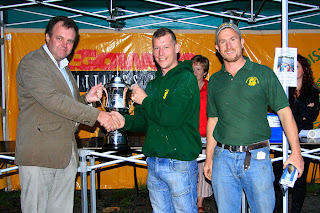 This open pike competition will be held next Sunday, 2nd of November '08 on Lough Scur. Pounds recorded! Fishing will be from 10am to 3pm (4pm weather permitting). We will be starting from the Marina in Keshcarrigan. Anybody interested in driving there together from Boyle, we will be meeting at McGraths, Carrick Road at 9 am. The Presentation of prizes will take place in Clancys Bar, Knockvickar at 8.30 pm. Here is the update of our Angler of the year League table after Sundays fishing. There is now only two competitions to go to decide this years winners. Next event is the Clancy Cup on the 2nd of November on Lough Scur, followed by our last competition on Lough Key on the 16th November. Congratulations to Sharon Greene and John Nicholson on the Birth of their Baby daughter Rihanna. Well Done. Rihanna was born on monday afternoon and I am told a fine baby she is weighing in at 9lbs 5oz. Sorry John, although you are probably never going to forget that weight, we can't record these pounds here (-: !!! But that's not all, this joyful event also makes Club member Christy Greene a Grandad again and our PRO David Greene is now also an uncle again. Of course Junior member Gary Nicholson is now also an uncle. Congratulations to all of you and your families! Great news. Club member Jim Clarke now is officially a Grandad! Jim and his wife Sharon, both became Grandparents last week, when their daughter Aisling gave birth to a Baby Girl. Congratulations to Jim, Sharon, Aisling and her partner, Well done!!! 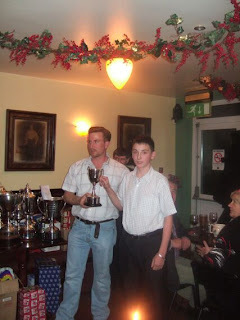 The Michael Conroy Perpetual Cup - Memorial Pike Competition will be held on Sunday next, 12th October 2008. Venue for this event is Lough Skean, Ballyfarnon. Fishing from 11am til 4pm. The presentation of all prizes will take place in Dodd's Bar, Boyle at 9pm. 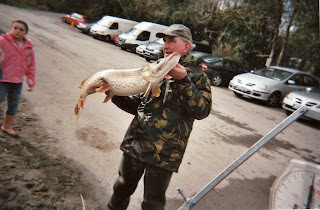 This is an open pike angling competition, boat angling only. Members pounds recorded. There will be refreshments on the Shore during the day. 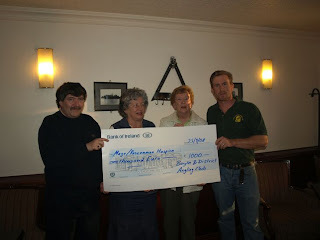 At a recent presentation in the Royle Hotel - Boyle, Committee members of Boyle & District Angling Club presented a cheque for €1,000 to Mayo/ Roscommon Hospice. 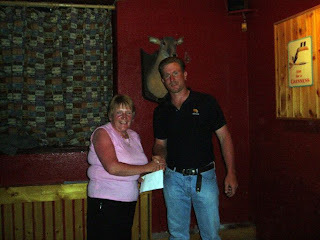 The monies where raised during this years Martin Mitchell Perpetual Memorial Cup Fishing competition in late August. Pictured are Brian Rush - Club secretary, Pamela Stewart and Mary Ryan - both on behalf of Mayo/ Roscommon Hospice and Bodo Funke - Club Chairperson. A meeting of Boyle & District Angling Club will take place on Thursday 25th of September in Tawnytaskin School. See you there. 1st: John Nicholson 58lbs 7oz. 2nd: Eamon Conroy 39 lbs 13 oz. 4th: Bodo Funke 26lbs 15 oz. 5th: David Greene 24lbs 2 oz. 6th: Brian Rush 22lbs 8oz. 7th: Jim Clarke 20lbs 1 oz. 8th: Bas De Ridder 17lbs 11oz. 10th: Francis McGlynn 16lbs 8oz. 3rd: Denise Ryan 5lbs 1 oz. 4th: Jane Suffin 4lbs 6oz. 5th: Ann McGlynn 2lbs 3oz. 1st: Gary Nicholson 17lbs 4oz. 2nd: Patrick McDonnell 9lbs 15oz. 3rd: Ben Geoghegan 5lbs 10oz. 4th: Grainne Gallagher 1lbs 1oz. You might have noticed a few changes on this blog over the last few days. Indeed a few more might happen yet. For the better of course, I hope. Any feedback welcome! if you scroll down to the bottom of this page you will anymore find a calendar. 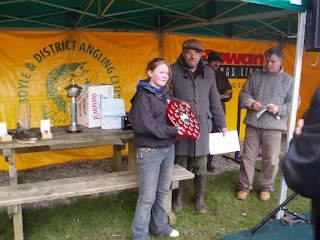 It is going to be frequently updated and will include our own calendar of events, scheduled meetings, other clubs competitions and angling events throughout the country, as far as we are aware of them. It also includes public holidays and some major GAA fixtures. Have a look at it and see what you think. It might help to some extend to avoid clashing of dates. It is hoped that we might be able to get the dates of our neighbouring clubs and include them for our information. We hope this is useful and look forward to familiarise ourselves even more with this kind of technology. So all members please check the calendar every now and again for our own events and perhaps other items that might be of interest. 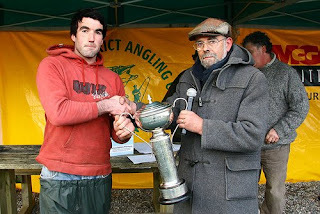 The Martin Mitchell Perpetual Memorial Cup was fished for yesterday. A good day was had by all, thankfully the weather held up well and many turned up to support the event. 46 Anglers entered this worthy Charity Competition. The Winner with a fish of 18lbs. 14 oz. was David Greene. Congratulations to him, he did not only win a fantastic Cup, but he also caught a new personal best fish for himself. Well Done!!! 2nd was John Keenan with a 16lbs. 1oz. pike. Same goes here, John too got a new PB on the day. Well Done! 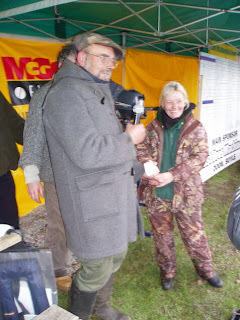 3rd was Jim Clarke with a fish weighing 8lbs. 1 oz. Best in the Ladies section was Lucy Garvin. 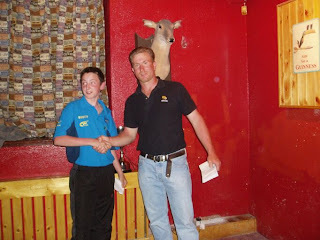 and best Junior Gary Nicholson. to the Mitchell Family, to all our own helpers, and to our catering team on the day. Also thanks to Sean O'Dowd for taking photos of the presentation. 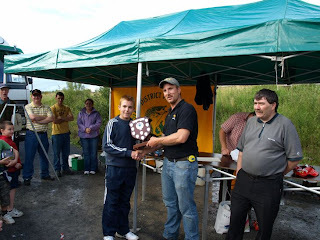 Boyle & District Angling Club are holding the Martin Mitchell Memorial Perpetual Cup on Sunday the 24th of August on Lough Key. This is an open pike angling competition. All proceeds are in aid of Roscommon/Mayo Hospice. Fishing is from 2pm to 8pm. Entry and Start at the Doon Shore, Lough Key. There will be Tea/Coffee, light refreshments available at the Doon Shore. We realise that this event clashes with the Horse & Pony associations Racing Day. This has been unfortunate coincidence, but nevertheless it can't be said that there isn't a lot going on around Boyle that weekend! Both events are for good local causes so let's hope that turnout will be equally good for both organisations. We certainly wish them well and hope that the weather will be kind too. 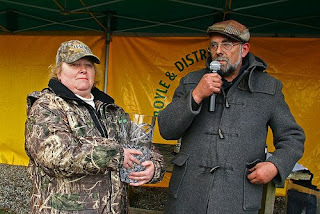 Boyle & District Angling Club has a history of friendship with the Horse & Pony Club and members of both organisations have helped each other out on many occasions in the past. In spite of the clashing events, we hope that this tradition will not be broke on this occasion and to give them a hand setting up on the Saturday. Any volunteers please contact our committee, re: meeting time, etc. 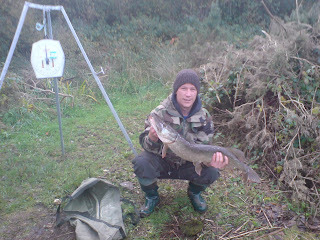 Boyle & District Angling Club are holding a meeting on Thursday August 21st in Tawnytaskin, time 10 pm. The Junior competition held during the Music Fest on Saturday last, turned out to be a great success once again. It is great to see more and more youngsters showing an interest in fishing; the numbers certainly confirm this this trend, with 38 juniors that turned up this time! A lot of fish were caught by the young anglers, mainly perch and also some roach. Thanks to everybody that turned up, all our helpers, our sponsors, Abbey Marine & Field Sports for sponsorship of the two main prizes, Abbey House for sponsorship of bait. And of course thanks to the Music Fest Committee for staging the Fest. It is good to see events like this happening in the town of Boyle. Shannonside FM are in town since yesterday. 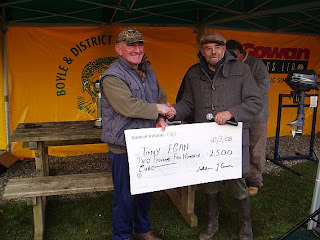 Along with other local items that are being aired during the two day Boyle visit, Boyle & District Angling Club have been invited to the Joe Finnegan Show for a brief interview about angling. Today two of our clubs representatives will be live on air on the program at 9.30 am. Tune in if you can. John Nicholson 52 lbs 6 0z. Eamon Conroy 39 lbs. 13 oz. Brian Rush 22 lbs. 11 oz. Bodo Funke 21 lbs. 8 oz. Gerry Lyons 17 lbs. 10 oz. Francis McGlynn 16 lbs. 8 oz. Bas De Ridder 13 lbs. 4 oz. Myles Quinn 13 lbs. 2 oz. Lucy Garvin 17 lbs 14 oz. Ann Conroy 14 lbs. 2 oz. Denise Ryan 5 lbs. 1 oz. Jane Suffin 2 lbs. 12 oz. Ann McGlynn 2lbs. 3 oz. Gary Nicholson 12 lbs. 12 oz. Patrick McDonnell 9lbs. 15 oz. Ben Gheoghegan 5 lbs. 10 oz. 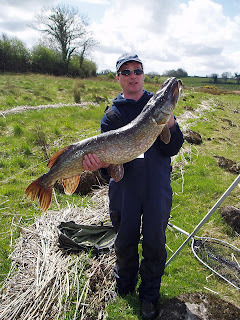 Here is the results of Sundays Pike Angling Competition. 25 Anglers fished for the Paddy Kelly Cup on Lough Key. The winner was Brian Rush with a great fish of 14lbs. 4oz. 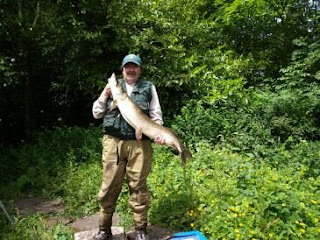 In second was John Nicholson with a fish of 13 lbs 3 oz. 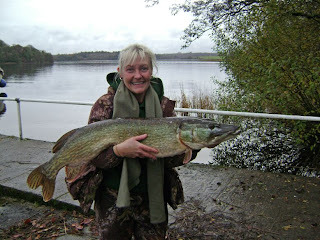 Third prize went to Ann Conroy for her nice pike, weighing 4 lbs. 7 oz. 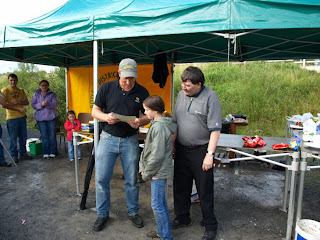 Spot prize winners were: Jane Suffin, Billy Reid and Jim Clarke. Thanks to all participants and helpers, to Gundy for weighing and a big Thank you to Gillian and Nigel at the Crannog Bar for hosting the presentation on the night. 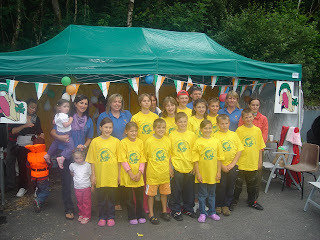 A very successful childrens competition was held on Saturday last. 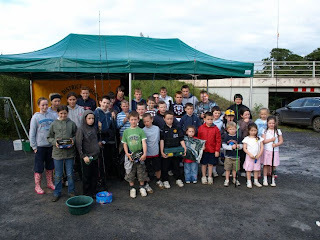 33 Juniors turned up to fish at the Woodenbridge, Boyle. Most kids caught fish and the weather was kind on the day. A big Thank you to all the juniors for taking part and to everybody that helped on the day. Thanks to all sponsors, including Abbey Marine & Field Sports , Abbey House B&B and Jamestown Tackle. Also Thank you to Gerry Mattimoe for coming along to present the Gerry Mattimoe Cup. Here is a few photos that were taken on the day. 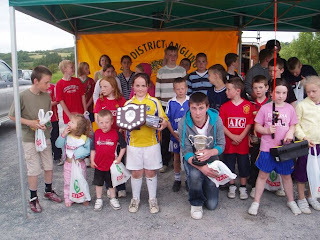 Boyle & District Angling Club will hold a childrens competition on this Saturday, 7th June'08 at the Woodenbridge, Boyle. Fishing will be from 5pm to 7pm. Competing Juniors will fish in two categories: 16's and under and 10's and under for the Gerry Mattimoe Cup and the Junior Shield respectively. 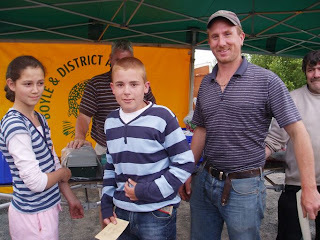 There will be a BBQ and refreshments for the junior anglers. Let's hope that the weather will be good and that many juniors will turn up. 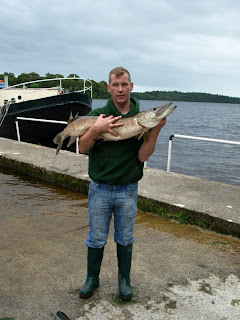 On Sunday we will hold a pike angling competition on Lough key, Fishing will be for the Paddy Kelly Cup, from 11am to 6pm. This is a pounds recorded competition. Presentation of all prizes will be in the Crannog Bar, Boyle at 8.30pm. Photos of a recent night out in Daly's Pub, Boyle. The occasion was the presentation of the Odbert Cup. 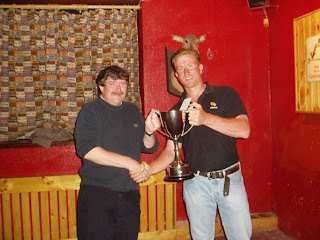 The Cup, which had only recently been donated to Boyle & District Angling Club by relatives of the late Odbert Family, Greatmeadow, Boyle, was fished for during a trout angling competition on Lough Key over the weekend. 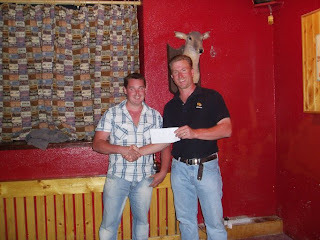 A big Thank you to all anglers, helpers and to all at Daly's Pub for hosting the presentation on the night. A meeting of all water keepers of Boyle and District Angling Club will be held this Thursday night at 10pm in Tawnytaskin School. All waterkeepers and potential users of the patrol boat please attend. A mayfly trout fishing competition will be held over this coming weekend. Fishing will be 10 am to 10 pm on Saturday and 10 am to 8.30 pm on Sunday. 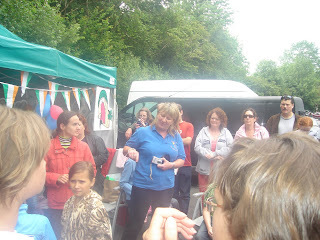 Entry fee is € 10 and must be paid before any fish can be weighed. This competition is limited to fly fishing methods and dapping only. Entries will be taken at the Doon Shore from 10am to 11.30am Saturday and 10am to 11.30am on Sunday. The Presentation of prices will take place on Sunday night at 9.30 pm in Daly's Pub. 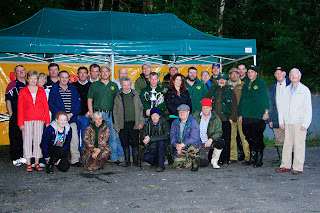 An extraordinary general meeting will be held by Boyle & District Angling Club on Thursday, June 5th, 2008 in Tawnytaskin School at 10pm. 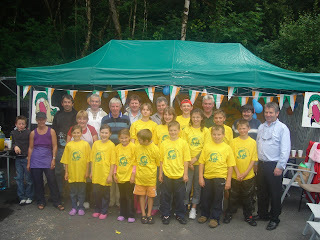 The Shannon Regional Fisheries Board recently held their annual Fisheries awareness week. 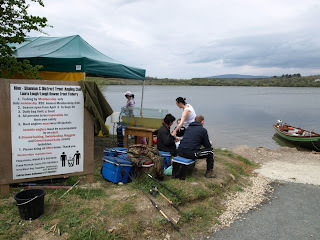 With the assistance of various angling clubs from the area, including our own Boyle & District Angling Club, a day for kids was staged at Rowan Lough, Co. Leitrim. 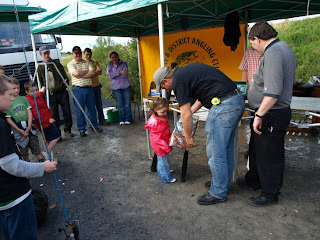 The motto of this event was: "Bring a child fishing". 26 youngsters turned up on the day including some from Boyle. Items of the day included a kids competition on the trout lake, introductions into angling and aquatic life, display of native fish and other aquatic species, and a Barbeque. 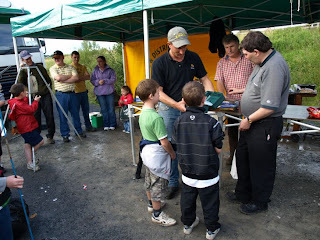 A meeting of Boyle and District Angling Club will be held on Thursday 1st May 2008 at 9.30pm in Tawnytaskin School. All members please attend. Well, here is the new updated league table as it stands after Sundays fishing. 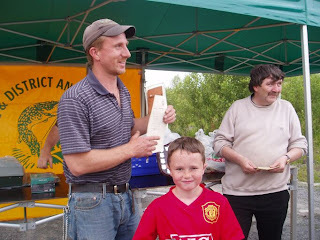 Shown above is Kieran McCormack, Killishandra, the winner of this years Paddy Kelly Memorial Competetion with his winning fish. 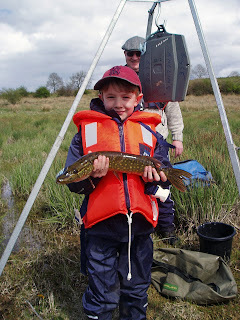 Also pictured is local Junior angler Ben Geoghegan with one of several pike he caught on the day. Well Done Ben!!! It's great to see more Juniors coming along and getting involved in the wonderful past time that angling is. Thanks to everybody for participating in the latest poll. It gives me an idea on how often I might want to update this page. Seems I 'm going to be busy then! I endevour to update this page frequently, but members please also feel free to send me some stuff for publication here. Anything you might find of interest or a good photo of a fish or anything else you would like to share with the Club, please drop me a line at: info@boyleangling.com or alternatively give me a call. A bit of food for thought, any chance to turn back time??? Just to remind everybody, there will be a meeting of the Club tonight in Dalys lounge at 9pm. 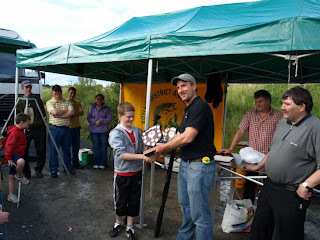 Also don't forget that we will be fishing for the Paddy Kelly Memorial Perpetual Cup on Sunday; Venue: Lough Na Blaithe. Looking forward to see you there. Just a reminder to all junior anglers that received a tackle voucher for Terry Mann's, Jamestown tackle, don't forget to go over sometime soon and redeem your vouchers. I am not sure how long they are valid for, but probably not forever. Seamus wonders whether there's a canine section of the Angler of the year? There will be a meeting next Wednesday, 23rd April 2008 at 9pm in Daly's Lounge. Just a quick reminder, we are meeting tonight at 8pm at Tawnnytaskin School to do some badly needed tidying up after our Easter Competition. Please attend in good numbers, as all hands are wanted on deck, so to speak!!! Here is an update on our Angler of the Year League. 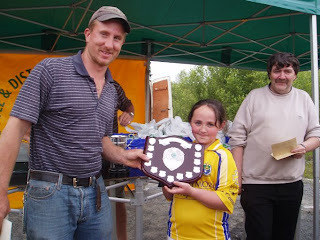 Next fixture is the Paddy Kelly Memorial Perpetual Cup, which is being fished on the 27th of April 2008, on Lough Na Blaithe. 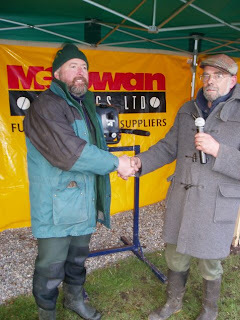 The first photos of fish from our Easter Pike Angling Competition have finally arrived with me. Pictured here is Tony Egan with his very pretty 22lbs. 10oz pike that landed him the second prize. 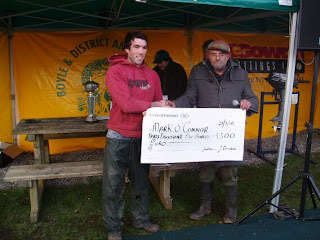 I hope to have a photo of Mark O'Connors winning fish for you later today. A meeting of the Club will take place on next wednesday 9th of April 2008 at 10 p.m. in Tawnnytaskin School. 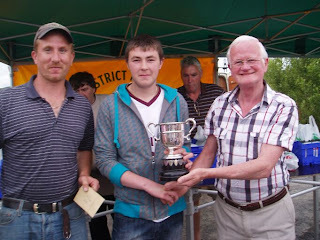 The next upcoming competition is the Paddy Kelly Memorial Perpetual Cup, which is being fished on Sunday the 27th of April. The venue for this competition is Lough NaBlaithe. Fishing is from 11 am to 6 pm. As usual our strict Catch & Release policy is in place, please support this policy. 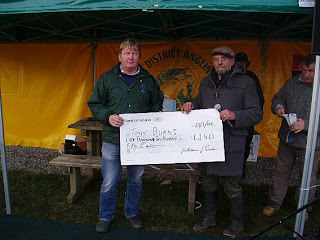 The above picture was taken a recent presentation of a cheque of €1000 to the Brothers of Charity, donated by the Boyle and District Angling Club. Shown in photo is Club Secretary Brian Rush, Veroncia O’Connor, Reach Tutor, and accepting the cheque on behalf of the Brothers of Charity are Anthony and Thomas. I would have liked to include photos of some of the pike from last weekend by now, but haven't yet received any! Perhaps somebody who took shots of any of the pike during the festival would like to e-mail me them, so I can include them here!!! Our next club competition will be the Paddy Kelly Cup, which is going to be fished on Lough Na Blaithe on the 27 of April next. Also for anybody who is interested: Waterways Ireland are holding their big competition next weekend (5 & 6th of April). First prize is a boat, engine and trailer worth €13,500! 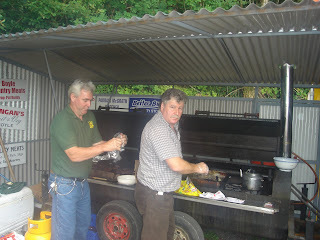 Information and booking through Leitrim tourism. The Winner of this years event Mark O' Connor receiving his prize of €3500 and the Moonstone Jewellers Perpetual Cup. 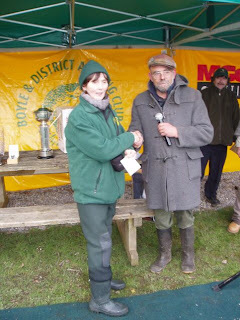 Sharon Diggins came first in the Ladies section. Our Patrol boat was out almost non stop on both days of the event, ensuring safety and fair play on the water. Pictured here is David Tormey on Duty. 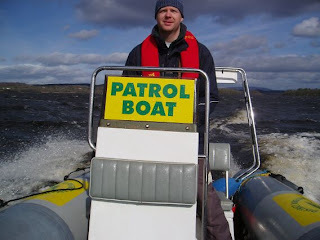 He is one of 7 members that are fully trained on boat handling.